About a year ago, we introduced the Berlin-based artist Born In Flamez, a deliberately amorphous, intangible entity signifying a musical project that emphatically rejects any notions of both genre or gender. 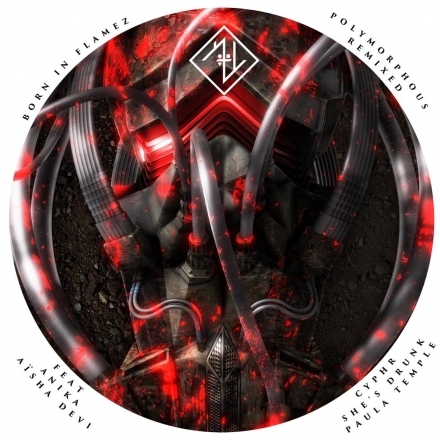 Born In Flamez' debut EP Polymorphous was, accordingly, hard to grasp and impossible to define. Floating freely between hints of grime, a very local flavour of stone-cold techno, and some of the more gloomy corners of otherwise surprisingly accessible pop, Polymorphous spelled out the conditions of possibility of a future that, if slightly dystopian, may help overcome the reality of the patriarchy that defines our present. With such a concept, the EP almost naturally functions as the blueprint for the imaginations and projections of other, like-minded artists, which makes the release of the forthcoming remix EP seem almost inevitable. CYPHR, Paula Temple, She's Drunk, and Anika all re-interpret BIF's tracks, thereby creating their very own version of a trans- or even post-human tomorrow. Of all the tunes on the EP, however, it is Aïsha Devi's riveting, haunting remix of the rather quiet and pensive Polymorphous closing track "Easier Like That", which captivated us the most. Fresh off her own, excellent debut LP Of Matter and Spirit, the Swiss-Nepalese producer thoroughly deconstructs the original, turning it into a disruptive intervention that offers an almost epiphanic dramaturgy. Take a listen below. Polymorphous Remixed is out via UnReaL Audio on October 16. On short notice, Born In Flamez will support HEALTH at Berghain tonight, starting at 9pm. There might be a few tickets left, get more detains over here.